The wedding season is well under way, and we have already had many weddings, and there are still many more to come in the next few months. Our first wedding of the season at Aphrodite’s Beach Wedding Venue, really couldn’t have gone any better. Firstly, the couple were amazing, so easy to get along with and they had a “stand out” wedding (to say it was our first at the venue). I have been in touch with the bride for well over 2 years now, and it was fantastic to be able to see all those emails “come to life” on her wedding day. 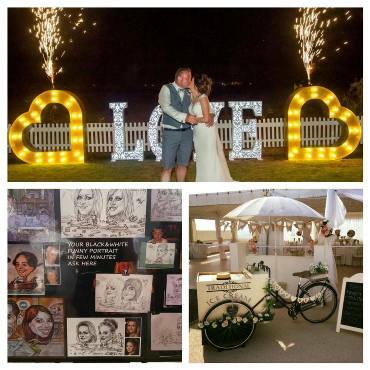 We arranged various entertainment for them, for throughout the day, from the ice cream tricycle from Love me Do (one of my fave’s since I get to “sample” an ice cream too), the caricaturist – who was kept extremely busy for more than his allocated stay. One of my new favourites, and the first time I got to see him, is the table magician, who I thought was fantastic. As it started to get dark, they had the fabulous Love Lights from Cyprus Dreams, and gerbs from Pyrgos which were a great start to the couple’s first dance. They also had a fab singer, who got everyone up dancing and singing along to his songs, before our DJ took over, and kept the party going until after midnight. It really was a fun packed day for everyone, and I’m sure, one the happy couple and all the guests won’t forget in a hurry. What a magical start to the wedding season, and I hope it carries on, as it started.